Farah, who won 5,000 and 10,000 gold at the 2012 and 2016 Olympics and won six world titles at those distances, ended his track career this year to concentrate on road running. 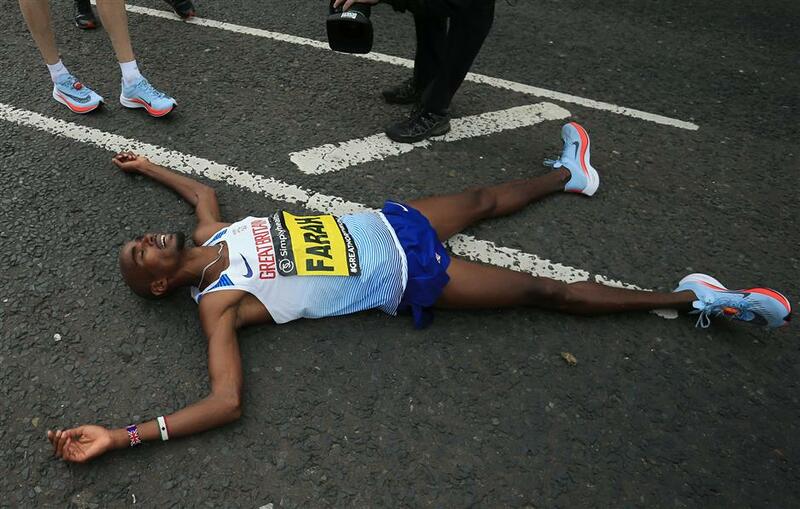 Britain's Mo Farah lies on the road after winning the men's elite race of the Great North Run half-marathon in South Shields, northeast England, on September 10, 2017. British track great Mo Farah said he wants to start "a new adventure" after confirming on Sunday he will compete in next year's London Marathon. Farah, who won 5,000 meters and 10,000 meters gold at the 2012 and 2016 Olympics and won six world titles at those distances, ended his track career this year to concentrate on road running. He will compete in the London Marathon for the third time. "I can't wait to start a new adventure racing on the roads in 2018, starting with the world's greatest marathon," Farah said after winning the Great North Run for a fourth time. "The London Marathon is my home race and it is so special to me. The previous times I have taken part (in 2013 and 2014) were amazing. The atmosphere on the course was unbelievable. "When I decided to concentrate solely on the roads from 2018 I knew that I wanted this to be my first marathon. I can't wait for next April and will be training as hard as ever over the coming months to ensure I'm in the best shape possible." The 34-year-old ran only half the race in 2013 to gain experience but completed the whole distance a year later when he finished eighth in 2 hours, 8 minutes and 21 seconds. He has not run one since, although he is the British record holder at the half-marathon distance. Farah delighted crowds on the northeast coast near Newcastle on Sunday when he claimed victory in the Great North Run in a thrilling finish, edging out New Zealand's Jake Robinson to win in 1 hour, 6 seconds for the 13.1 mile route. London Marathon winner Mary Keitany of Kenya won her third victory in the women's race in 1:05:59.